Get inspiration for a great family day out with 14 of our favourite things to do on Scottish beaches. If there’s one beach where you can really make an entrance, it’s Traigh Mhòr on Barra. This beautiful island in the Outer Hebrides uses the beach as the landing strip for its airport, and is regularly voted one of the world’s top airport approaches. Tuck into a delicious Scottish picnic, just like this one on Orkney’s Rackwick Bay. Bring a basket full of local produce, or enjoy sweeping sea views as you tuck into locally-caught fish and chips or seafood from nearby takeaways or restaurants. If basking in the sun for hours on end sounds more like boredom than bliss, get active instead! The beach is a great place to try a new sport, whether it’s wakeboarding over the waves or land yachting across the sand (pictured). Check out our blogs on unusual watersports and summer activities for ideas. They might look peaceful from afar, but rock pools, like this one in Dunure in Ayrshire, are in fact buzzing with life and activity. Keep your eyes peeled and you could spot whelks, limpets, crabs, starfish, jellyfish or even shrimp and lobsters. From gannets to guillemots, you’re sure to see some of Scotland’s colourful birdlife on a trip to the beach. Find out more about puffins, kittiwakes, fulmars and the like at the Scottish Seabird Centre in North Berwick (pictured) or in our wildlife section. 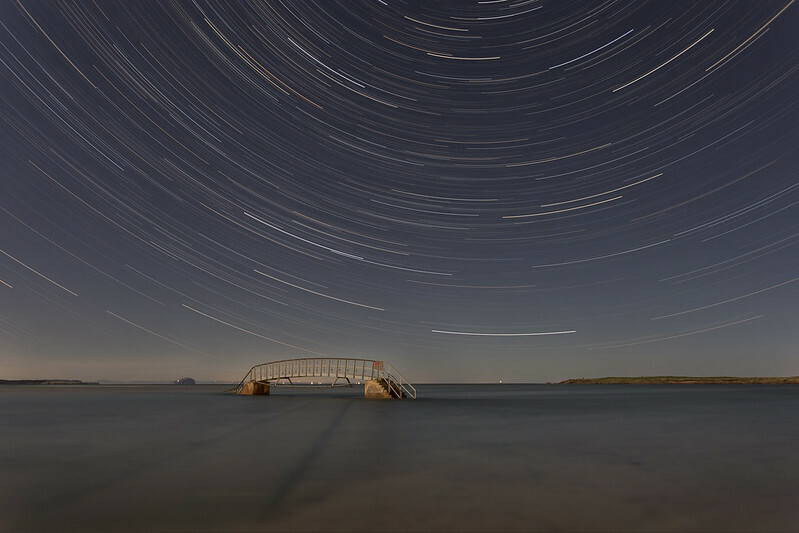 Part of the John Muir Way, the beach at Belhaven Bay near Dunbar is also famed for its ‘Bridge to Nowhere’. Contrary to what its name suggest, the bridge does actually have a purpose: it passes over a small burn, but at high tide it gives the curious impression of being stranded in the midst of the water. Give your sand sculpture a Scottish twist by basing it on one of your favourite real-life castles – maybe Eilean Donan, Culzean or Edinburgh? 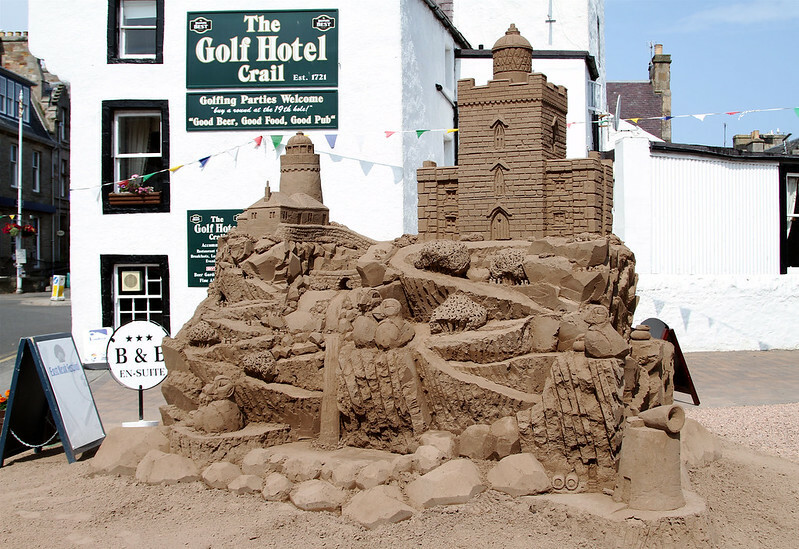 If you’re feeling really confident, battle some of Britain’s best beach architects in the Sandcastle Competition (pictured) at the Crail Festival in Fife in July. 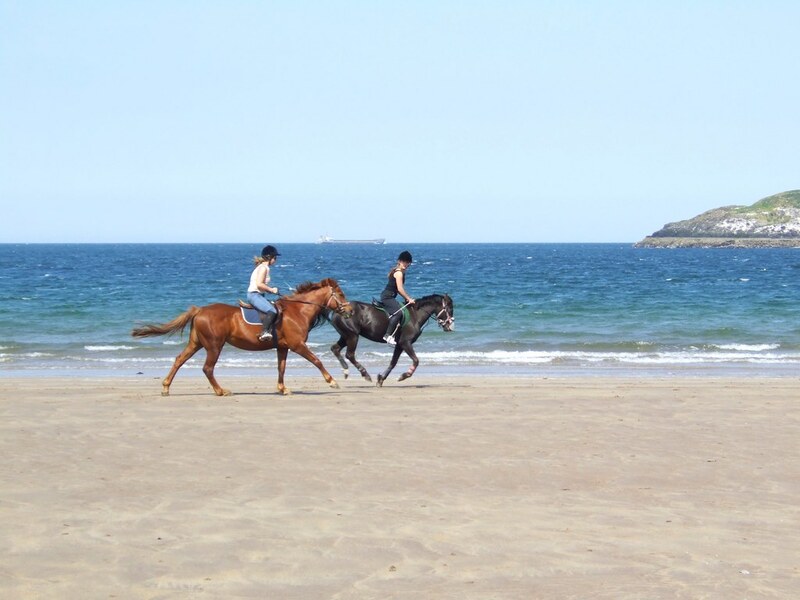 A gentle horse ride along the beach is one of the best ways to take in the gorgeous sea views (and rather more glamorous than the traditional donkey ride, too). You’ll find a number of riding schools offering this unique experience, such as Seacliff Stables in East Lothian or Highlands Unbridled in Brora. Quite a few of Scotland’s beaches have enjoyed a turn on the silver screen. 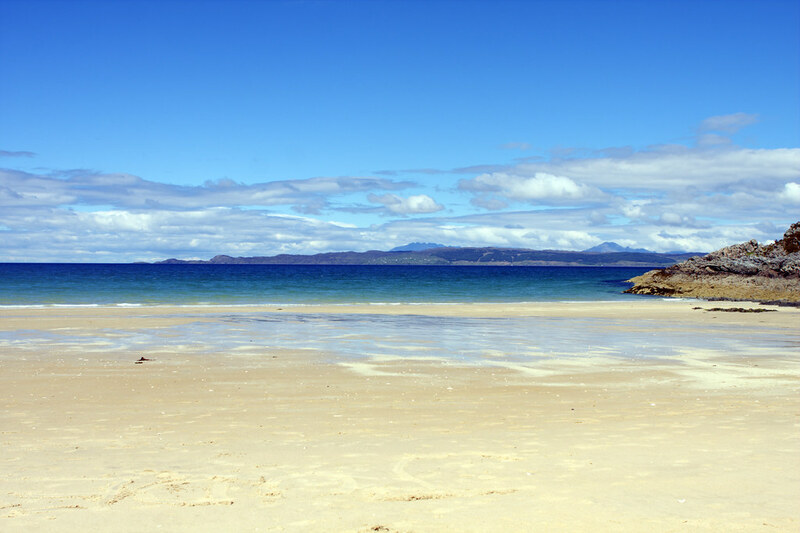 Recreate scenes from Local Hero on Camusdarach Beach in the Highlands, or charge down West Sands in St Andrews, where the famous opening scene of Chariots of Fire was filmed. Keep your eyes on the horizon when you visit Scotland’s beaches and you might just catch playful dolphins jumping and splashing in the water. 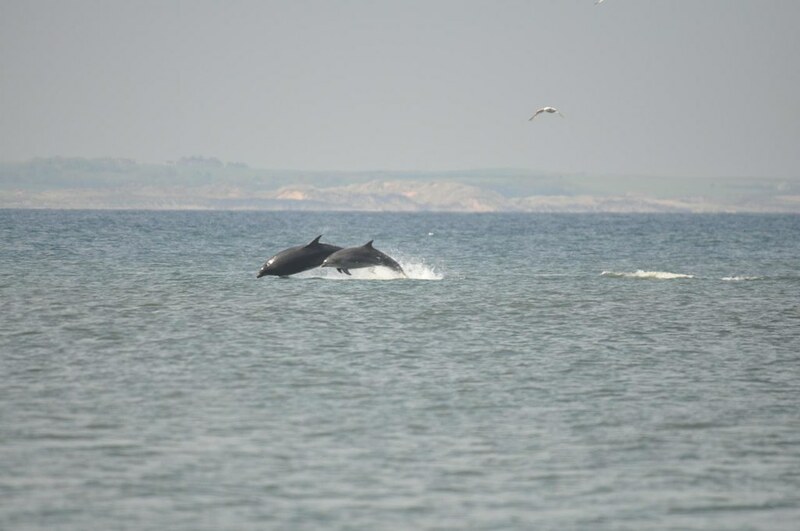 Chanonry Point in the Black Isle is one of the many great spots for seeing these beautiful creatures, as is the Banffshire Coast in Aberdeenshire. 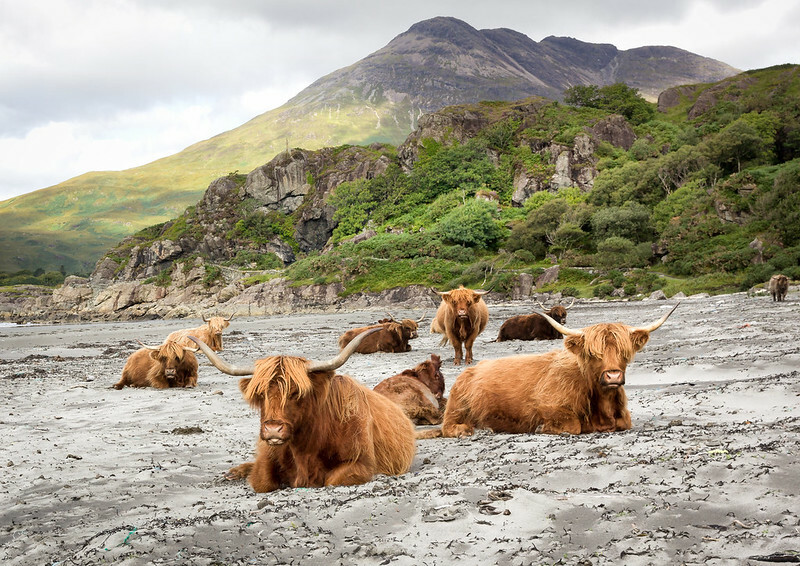 Believe it or not, it’s not that uncommon to see Highland cows lazing on the beach in more rural areas of Scotland. This lot were seen soaking up the sun at Laggan Bay on Islay, Argyll & The Isles. Take a picture if you’re lucky enough to catch a similar sight, and be sure to share it with us on Instagram and Twitter. Use #lovescotland or #visitscotland. This beautiful beach is in fact a tombolo, a strip of sand connecting the tiny St Ninian’s Isle with the coast of Mainland in Shetland. At 500 m long and up to 70 m wide at low tide, it’s the largest active tombolo in the UK – perfect for a wander, or even a picnic in its more sheltered corners. A stroll along the beach can sometimes lead you over millions of years of history. Fossils are found on many beaches around Scotland, so keep your eyes peeled. UKFossils.co.uk has detailed information on which areas offer the best chances of finding trilobites, graptolites and many more. Whether you’ve been relaxing with a book, exploring rock pools or windsurfing over the waves, a sunset walk is the ideal end to any day out on the beach. 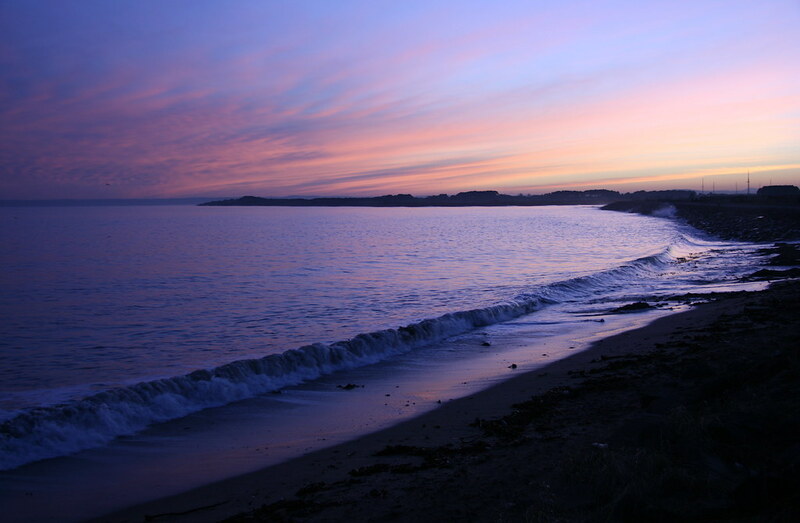 Walk along the sands and soak up the incredible colours, just like this serene scene in Carnoustie, Angus. Not sure which beach to visit? Find out more here, or check out which Scottish beaches were named Best in the UK at the 2015 TripAdvisor Travellers’ Choice Awards. Keep checking our blog for more great ideas on things to see and do in Scotland this summer, and be sure to share your pictures with us on Facebook, Twitter or Instagram. Have fun, and don’t forget the sun cream!